The Resource Conservation and Recovery Act (RCRA) and its state counterparts provide requirements to govern hazardous wastes during every step of their management, from “cradle to grave.” Although these rules are intended to improve management and provide incentives for recycling and other beneficial uses of hazardous wastes, many organizations find many of the rules unnecessarily onerous – and therefore potentially counterproductive if they actually discourage beneficial activities. In addition, over time changes in technologies, commercial activities and regulatory priorities reveal gaps in existing rules. In January, the Environmental Protection Agency (EPA) revised its “Definition of Solid Waste” rules governing a number of potentially hazardous wastes that it instead considers to be “hazardous secondary materials”, and the range of recycling and recovery activities eligible for special regulatory considerations. The revisions become effective on July 13, 2015. What Are “Hazardous Secondary Materials”? Hazardous secondary material means a secondary material (e.g., spent material, by-product, or sludge) that, when discarded, would be identified as hazardous waste under part 261 of this chapter. EPA’s use of the subjunctive “would be discarded” tells us how EPA considers spent materials, by-products and sludges that are managed in some way other than being discarded. The most recent changes revise the lists of materials being addressed, and the non-discard activities that qualify for special regulatory consideration. Most importantly, reclamation of a hazardous secondary material may qualify for one of two dozen exclusions—a specified material managed in a specified way is not a solid waste (i.e., is excluded from the definition, and therefore from all associated regulatory requirements). Which General Revisions Apply To Hazardous Secondary Materials Handling? Revises the definition of “legitimate recycling” to focus on whether the products make a “useful contribution” to an economic process, confirming that in-process recycling and transfers to other processes can both be legitimate. Revises rules for transfers to third parties, to require that the recipient be a “verified” recycler or reclamation facility (i.e, with appropriate permit or variance to conduct the activity). 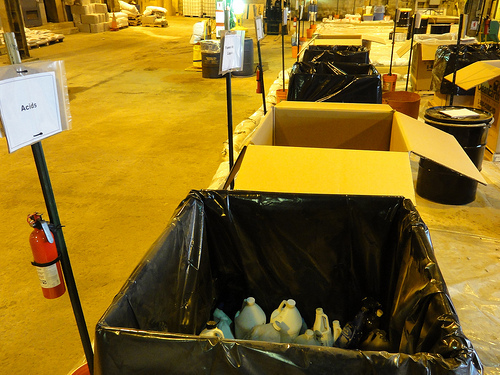 Clarifies onsite management requirements, including container labeling. What Revisions is EPA Making to Material-Specific Exclusions? Reclamation under control of the generator’s organization (revised). Change from requirement for land-based management at the generator’s facility to management under control of the generator’s organization (i.e., including at other facilities). Addition of details to requirements for emergency preparedness and response programs. Reclamation at a third party “verified reclamation facility” (revised). Addition of requirements that facility be subject to formal regulatory authority to conduct reclamation (permit or variance). Conforming requirements to notify EPA or state agency, providing reporting. Clarify onsite management requirements (including containment). Excluded exports (repealed, so all exports will be subject to RCRA requirements). Remanufacturing specified solvents from specified industrial sectors (new). Available only to these solvents: toluene, xylenes, ethylbenzene, 1,2,4-trimethylbenzene, chlorobenzene, n-hexane, cyclohexane, methyl tert-butyl ether, acetonitrile, chloroform, chloromethane, dichloromethane, methyl isobutyl ketone, NN-dimethylformamide, tetrahydrofuran, n-butyl alcohol, ethanol, and/or methanol. Available only if solvent originated from chemical processing use (e.g., reacting, extracting, blending) and not if from other uses (such as degreasing). Available only if generator in a specified sector: pharmaceutical, basic organic chemical manufacturing, plastics and resin manufacturing, or paint and coatings sectors. Available only if the solvents are remanufactured at a facility in one of those sectors. Available only if the solvents are then used in one of those chemical processing use at a facility in one of those sectors. Available only if the spent solvents are managed in compliance with new, detailed standards for containment, tank systems, and air emissions. On or after July 13, 2015?